Today I want to show you what has been possible because of your help! Heute möchte ich euch zeigen was durch eure Hilfe möglich war! 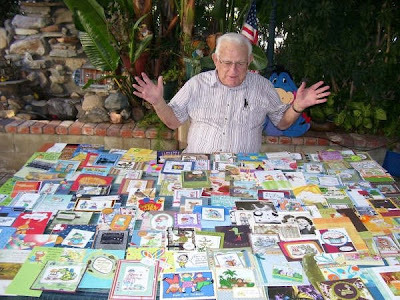 I am most grateful to all the people who took the time, effort, and expense of sending greetings for my 88th birthday. 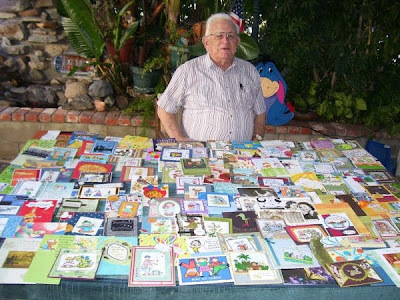 My son Frank initiated the idea abetted by my granddaughter Tina, that caused an avalanche of cards totaling over one hundred and fifty. I received 46 cards on one day alone! Many were from relatives, but a great number were from people I have never met. Quite a number of different states were represented as well as many Canadian Provinces. 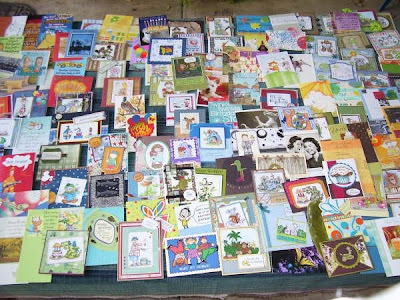 Many customers of Tina's stamp and card business in other countries were nice enough to send greetings. Represented were Australia, Austria, Canada, England, France, Germany, Iceland, Italy, Scotland, Switzerland, The Netherlands, and the Union of South Africa. All these were hand crated and showed effort and originality. My heartfelt thanks to all who sent these many greatly appreciated greetings. They made this a birthday to be well remembered. 150!!! cards.... can you believe it. These were true cards for a cause and I am very grateful myself to know such kind and generous people who took the chance to help! 150!!! Karten... könnt ihr euch das vorstellen? Diese Karten hatten wirklich einen besonderen Sinn und ich bin sehr dankbar, dass ich so großzügige und selbstlose Leute kenne, die die Chance zu helfen wahr genommen haben. Kimmie is celebrating her birthday with a week full of challenges and give aways. Congratulations Kimmie!! There is another fabulous challenge up on the Stamp Something Challenge blog with the chance to win some Whiff of Joy Stamps, why not give it a try? Oh, Katharina, thank you for sharing this! I was afraid I sent mine a little late, but I'm sure he enjoyed receiving cards for a continued period of time! What a blessings this craft has been! Thank you for allowing me to take part! This is so special... really wonderful photos! Thatä's so wonderful!! I missed it, unfortunately - I wish I could have been able to represent Sweden in that amazing pile of beautiful cards! A belated congrats to Frank, from Sweden!! I was tracking my card, but the tracking service still say me that the card is in italy... I was worry about that, but now I can see my card on your pic, so I'm happy. It does my heart good to see the delight these cards brought to him! I am so happy to have been a part of it! That is so great, it is nice to see that there are still good people in the world, thanks for sharing this story. Oh that is wonderful!!!! That's alot of cards,card makers are the best!!!!! OMG...that is sooo sweet. Grandpa is adorable. The cards are all so purdy. That's so awesome!! Ooo, I even see my silver embossed fish card there in the middle :) I'm so happy for him!! wow, das ist so fantastisch. Mir tut es so leid, das ich die Gelegenheit verpasst habe, weil es zu einer Zeit war, wo wir hier alle krank waren, ich hab es leider völlig vergessen. Aber es sind ja massig zusammen gekommen, der Hammer, und wie happy er ausssieht, das freut mich riesig. ganz tolle Aktion, super!!!! Wow, that's amazing, we've tried to do that for a member in our cardgroups dad, but I think he's still a few short from being that same amount as his age!